Advancing solutions to the climate crisis rooted in racial, social and economic justice, and committed to protecting front-line communities and workers. Protecting our right to clean air, water, land, healthy communities and a world at peace. Immediately stopping attacks on immigrants, communities of color, indigenous and tribal people and lands and workers. Ensuring public funds and investments create good paying jobs that provide a family-sustaining wage and benefits and preserve workers’ rights, including the right to unionize. Funding investments in our communities, people and environment to transition to a new clean and renewable energy economy that works for all, not an economy that feeds the machinery of war. Protecting our basic rights to a free press, protest and free speech. Big cities, like Chicago and Washington D.C. aren’t the only ones participating. There are four sister marches in the state of Illinois alone! Positive, peaceful demonstrations like the People’s Climate March are inspiring because they show us how many people are united behind the same goals. Just imagine–what if all the people who are taking to the streets were also making changes to their energy use at home? What a dent we could make in the country’s energy consumption! So even if you can’t make it out to the march this time, remember that there are a whole lot of things we can all do at home that put the eco-conscious values of the climate march into practice. 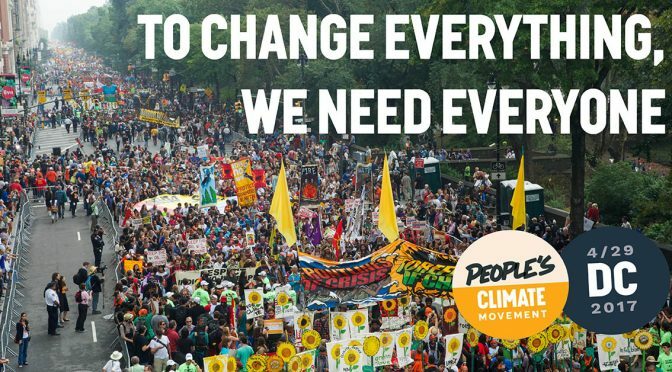 Tell us, are you at the People’s Climate March? Tweet us your thoughts at @smartpowerIL.